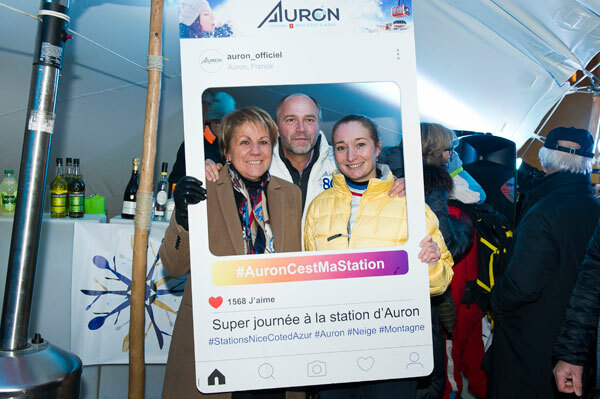 The Chefs au Sommet d’Auron – eighth edition – turn the iconic ski resort of Mercantour into the Capital of Mountain Gastronomy from 19 to 25 January 2019 with chef Virginia Basselot as godmother. 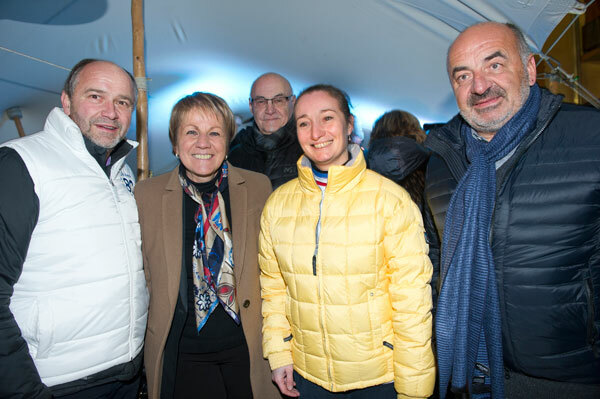 The Chefs au Sommet d’Auron 2019 were inaugurated on Saturday, January 19th by an exceptional keypad of five MOFs (Meilleur Ouvrier de France) who demonstrated their culinary skills. 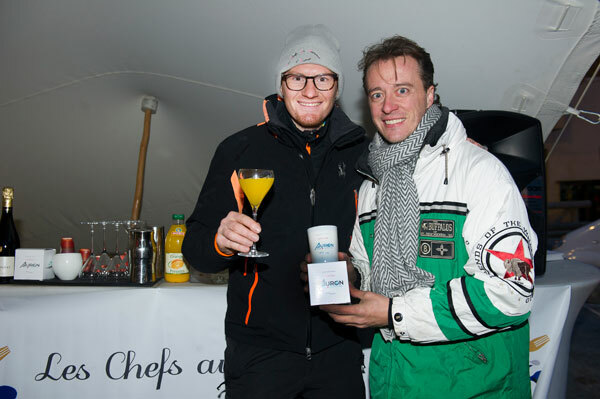 A Barista /Cocktails World Champion and a MOF Potter completed this tasty and festive gathering, placed under the sign of friendliness and friendship. 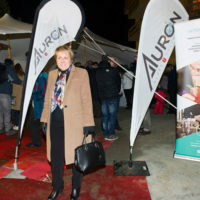 For a week, under the honorary presidency for the first time of a female chef MOF, Virginie Basselot, executive chef of the Hotel Négresco in Nice, the Chefs au Sommet d’Auron will deploy their talents through the many restaurants of the Mercantour and Vallée de la Tinée stations and cooking classes and tastings around the Auron ice rink. 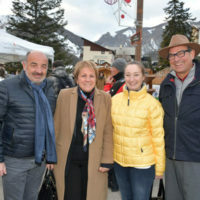 The chefs and cheffes will highlight the Bio and the Locavore to honor the gastronomic riches and quality products from the mountains, valleys and coastline of the High Country where they abound. 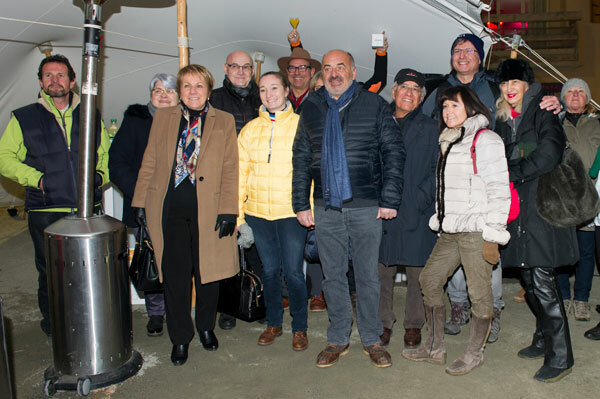 The products from our mountains come from the Association Montagnes Paysannes, a collective of producers from Puget-Théniers. 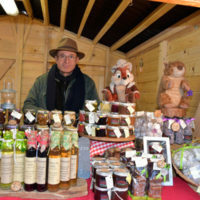 These noble products, from short circuits and organic culture, raised or cultivated with the love of our terroir, are sublimated by renowned chefs and pastry chefs and offered to gourmets at a very affordable price of 45 € for a gastronomic meal including appetizer, starter, main course and dessert (Reservations with restaurateurs). 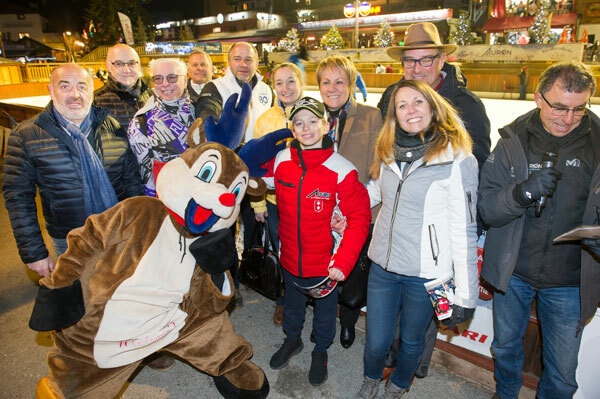 chefs shared their exceptional know-how and passion for the profession, sprinkled with grains of snow and friendship for the greatest pleasure of skiers and tourists who enjoy high mountains and good gastronomy. 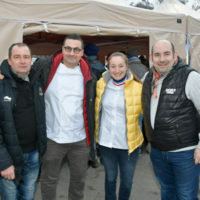 The chefs’ week of generosity and sharing of began with a tasting of refined dishes concocted by the MOFs. 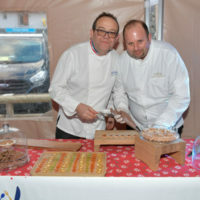 Jean-Marc Delacourt, JMD Conseils, surprised and delighted the gourmets with a Natural of Saint Jacques and Green Apples, Carpaccio de Bœuf. Eric Finon, from Maison Lenôtre, has delighted gourmet papillae with Lemon Sablé and Diamond Chocolate, Crémeux Praline and candied Lemons and Oranges. 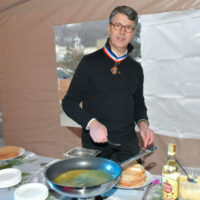 Denis Ferault, from the Regional College Hotelier and Tourism Paul Ogier in Nice, cooked flambe Crepes Suzette in front of a crowd of skiers hungry for scented sweetness. 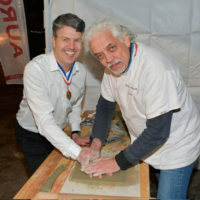 Stéphane Monalto, Meilleur Ouvrier de France Ceramist Potter, proposed to the public to immortalize their passage at Chefs au Sommet d’Auron by taking the imprint of their hand on a plate of clay. 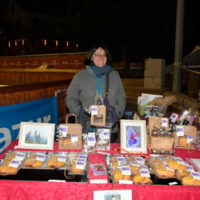 Art lovers were also able to discover the tantalizing photos of culinary photographer Aline Gérard. 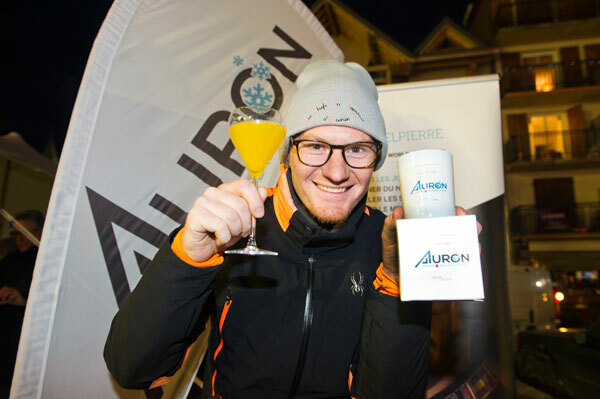 The talented and endearing Victor Delpierre, Barista/Cocktails World Champion (named after a mountain facing Auron), has imagined at the Chefs au Sommet d’Auron 2018 the Riounet, a cocktail that has become the official cocktail of the station. 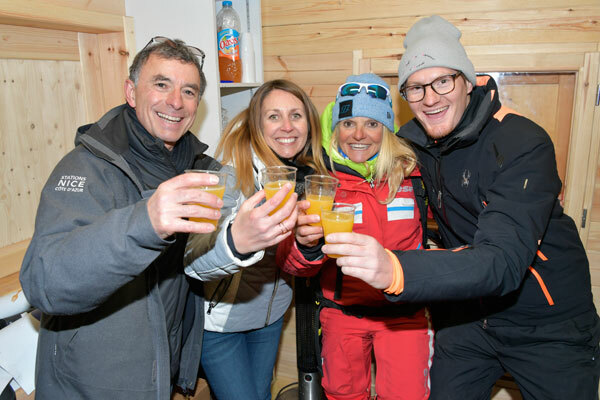 This harmonious beverage from the summits can be sip cold after a beautiful summer walk in the mountains, or be tasted as grog or mulled wine to comfort after a day on the snowy slopes. 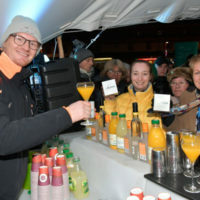 This same cocktail, completed to 50% with a bubble, Champagne, Crémant or Prosecco, becomes a great aperitif cocktail that will accompany your nicest festive moments. 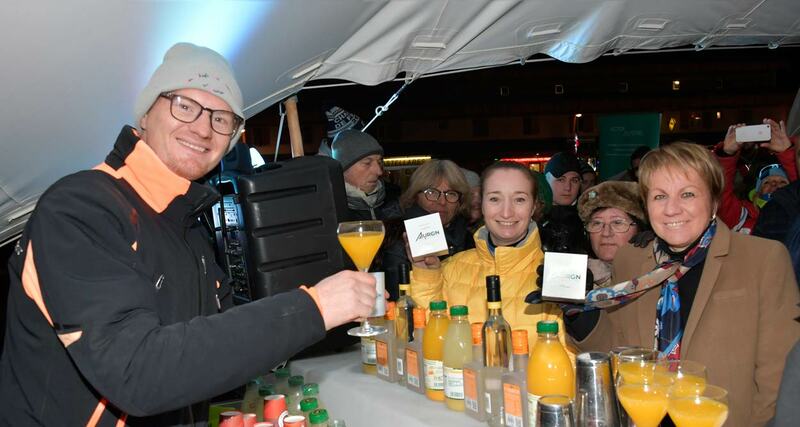 The Riounet is composed of Triple Sec, created in 1834 by Jean-Baptiste Combier, artisan chocolatier confectioner, in stills set up by Gustave Eiffel, a Distillation of Chocolate, Cream of Cocoa, to mix with Juices of squeezed Lemon and Orange. 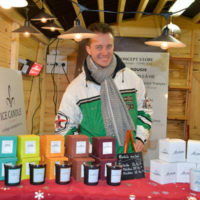 To magnify the station’s flagship cocktail, Victor Delpierre has transposed the Riounet flavors in the form of fragrances into the official candle of the station, in association with Arnaud Belloy from Ice Candle, to perfume the house. 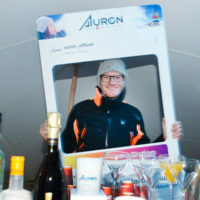 In addition to four-handed dinners – a chef and a pastry chef – every night, Chefs au Sommet d’Auron offer a rich program of gourmet After Ski, workshops and conferences from 19 to 25 January 2019, every day.. From 4 pm around the Auron skating rink, many activities await the locals and tourists who are fond of gastronomy: salty/sweet workshops for children and adults, conferences, culinary demonstrations with Chefs, signing sessions… by the chefs and pastry chefs. 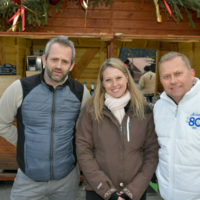 Everyday, Victor Delpierre will showcase his creations to taste around animations on the central square. 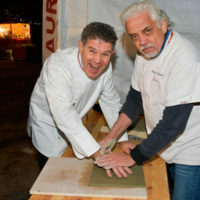 The Chefs au Sommet d’Auron invite you to six days of gourmet celebration to enjoy without moderation, around a recipe based on flavors from our mountains, snow, sun, relaxation, plus a touch of madness and good mood for a real cure of flavors and well-being at the top of the Mediterranean Alps.